Sherman Lambdin, (b. 1948) like his brother Edd Lambdin is a native of Kentucky. According to Betty-Carol Sellen in her book "Self-Taught, Outsider, and Folk Art" published in 2000, Sherman had worked in construction but became disabled. 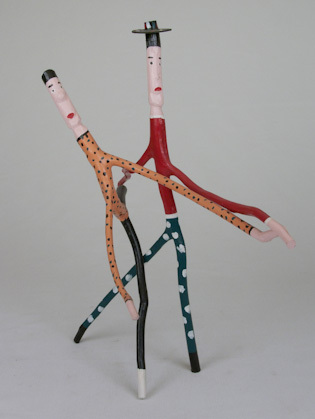 He and Shirley began creating and collaborating on work utilizing materials common to Edd's work. Their approach is simpler, more linear in nature. One of the pieces we have was purchased in 1989 from Art Jones Gallery in Cincinnati. It is a delicate, whimsical piece attributed to Shirley Lambdin of a girl with a bone and her dog standing on it's hind legs. 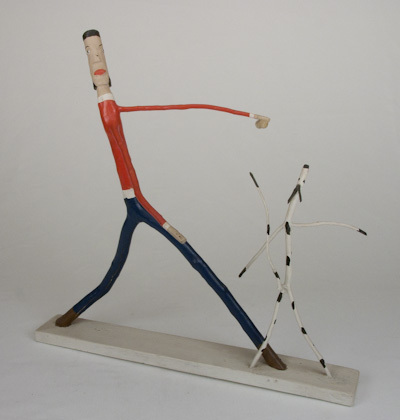 The dog is comprised of a wooden branch with little if any carving that is paint white with spots. The girl is "clothed" and her face is carved at an interesting angle. 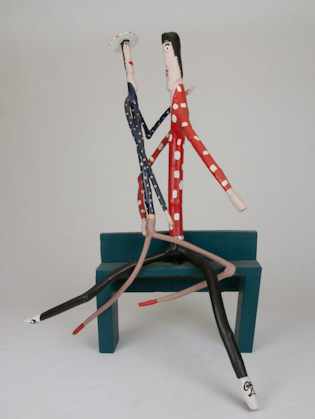 Another piece in our collection on which Sherman and Shirley have collaborated is called "Elvis and the Ballerina" also purchased through Art Jones Gallery in 1989, the figures legs are entwined as they embrace on a bench. Although the artists remain cloaked in secrecy, both of these pieces were purchased at the Art Jones Gallery with original provenance through consignment from Larry Hackley as received from the artists.